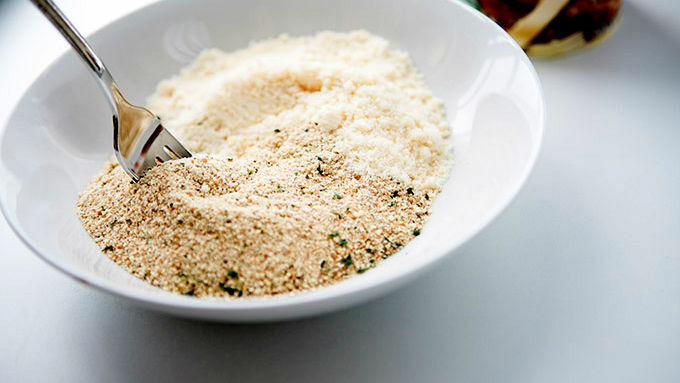 Heat oven to 400° F. In a large bowl, stir together parmesan and bread crumbs. 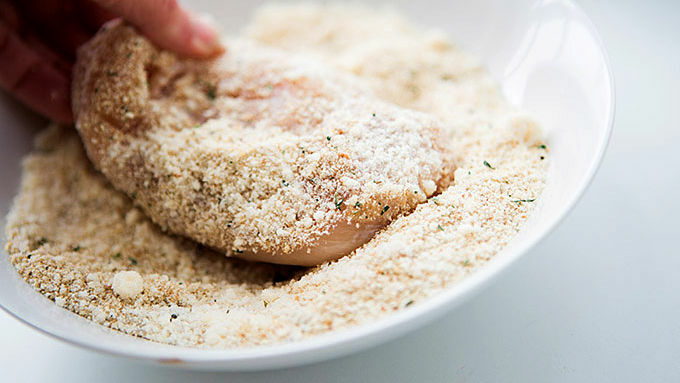 Dip chicken breasts in butter, then coat in parmesan mixture. Repeat. Place onto a parchment lined baking sheet. Place zucchini sliced around the chicken slices, drizzle with olive oil, salt and pepper. Bake for 12-15 minutes. Stir together Muir Glen™ tomatoes and garlic salt. Spoon a small dollop on top of each chicken breast. Top with mozzarella. Return to oven and bake an additional 7-10 minutes, or until chicken breasts are cooked through. 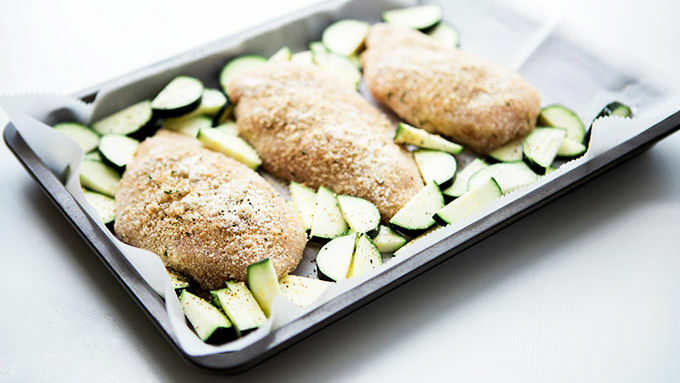 Allow chicken to cool slightly before serving with zucchini. Garnish with fresh basil. Know how you were wondering what to cook for dinner? I got you. There are chicken breasts in the freezer, right? Everyone always seems to have chicken breasts in the freezer. And you’ve got to have parmesan in the fridge. Yes? 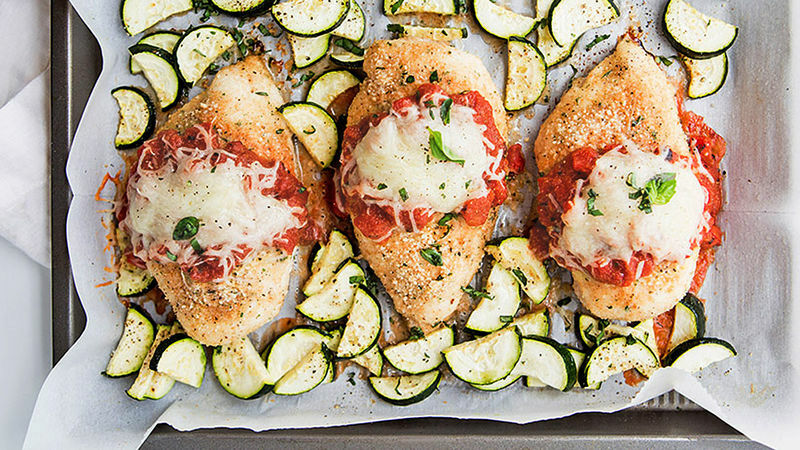 Nice.Those two everybody’s-got-‘em ingredients (plus a few other pantry basics) make the best crispy oven parmesan chicken for din-din. Or supper. Or whatever you call that after-lunch meal that makes life worth living. Flavors you love, served up in a whole new way. 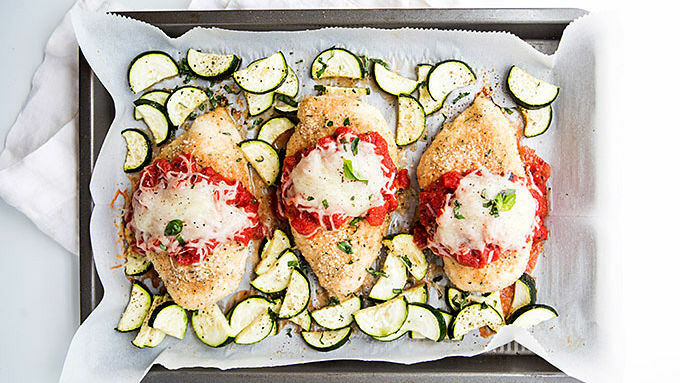 This Crispy Oven Chicken and Zucchini Dinner is a must-try tonight. And tomorrow night. And probably 7x weekly. But we’ll let you decide.